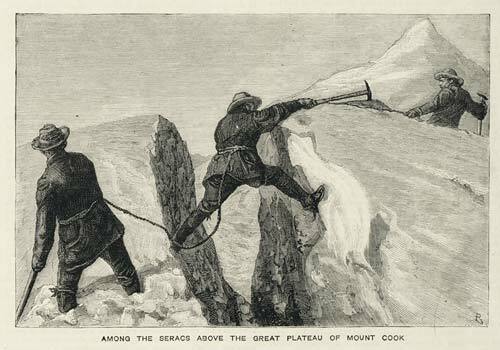 This engraving appeared in the London Graphic, under the title, ‘The first ascent of Mount Cook, New Zealand 1882’. In fact the three climbers – William Green, an Irish minister; and two Swiss, Emil Boss and Ulrich Kaufmann – did not reach the top of the mountain, but turned back 60 metres from the summit. But their achievement was widely represented as the conquest of the mountain.